Can Eating Healthy Lengthen Life? Many diet programs claim to help you lose weight, prevent chronic disease, and improve your overall well-being. However, could eating a healthy diet lengthen your life? A recent study in the New England Journal of Medicine reveals that healthy eating can extend life. Nutrition affects overall health in many ways. For example, those with diabetes must control intake of sugar. Therefore, natural sugars from fruits, veggies, and dairy products should be eaten versus processed sugars from colas, candy, and other sweets. On the other hand, those with high blood pressure should have a lower sodium diet. You can lower sodium in your diet by eating less processed food products such as deli meats, fast foods, and canned soups. Vitamins and minerals from the food you eat help keep your body alive. Calcium and vitamin D keeps bones strong, while vitamin C provides immune protection. Also, magnesium helps the body to use glucose efficiently, while potassium helps produce energy and nerve impulses. A recent study looked at 74,000 people over 12 years, during which 10,000 of them died. The review of the study looked at the dietary habits of the people in the previous 12 years of their life before the study. Those who added more fiber-rich fruits, veggies, and whole grains had a lower risk of death than those whose diets stayed the same. 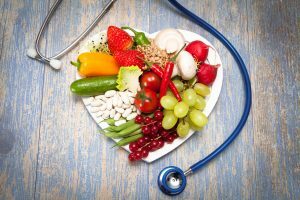 The Alternate Healthy Eating Index, Alternate Mediterranean Diet Index, and the Dietary Approaches to Stop Hypertension (DASH) Diet Index set the score of the diets reviewed. Fruits, veggies, whole grains, healthy fats, and other whole foods got higher scores. On the other hand, unhealthy processed, fatty and sugary foods got lower scores. A minor 20-percent change in diet helped decrease risk of death by about 8 to 17-percent. You could exchange a serving of red meat with a plant-based bean protein for such a change. Limit sugary foods like candy, cola, and ice cream. If you have a sweet tooth, find lower-calorie options like fruits, low sugar dairy products, or flavored teas. Cooking foods with dry cooking methods such as steaming, baking, broiling, or grilling. These dry cooking methods reduce the amount of fat added to foods. Fill most of your plate with plant-based foods such as fruit, veggies, legumes, and whole grains. These foods are lower in fat and higher in fiber than most meat and dairy-based foods. Add in a multivitamin like Zestia from Vita Sciences to fill your nutrition gap. If you are feeling tired, low on energy, or feel like your diet is lacking, a multivitamin can make sure your body gets the nutrition it needs to be its best. Zestia not only contains a full profile of vitamins, but also contains probiotic and Superfood compounds.